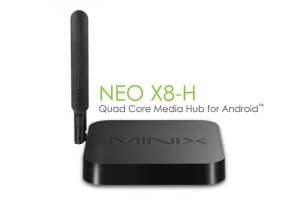 [dropcap size=big]D[/dropcap]er MINIX Neo X8-H ist eine 4K-fähige TV-Box mit Googles Betriebssystem Android und einem leistungsstarken Prozessor. Das Gerät ermöglicht die Wiedergabe von 4K-Inhalten. Auch zum Spielen soll sich der Player eignen. Der MINIX Neo X8-H ist ein kompakter Multimedia-Player, der auch in der Lage ist, 4K-Inhalte abzuspielen. Das Nachfolgemodell des X7 wird mit aktuellem Android 4.4.2 Betriebssystem und einem leistungsstarken Quad-Core-Prozessor auf den Markt kommen. Die MINIX-Box hat 2 GB Arbeitsspeicher und 16 GB Speicherplatz. Der Hersteller verspricht aufgrund der Quad-Core-CPU in Kombination mit der OCTA Core Grafikeinheit eine flüssige Bedienung. Die Leistung soll selbst für anspruchsvolle Anwendungen und Spiele ausreichen. Der Speicher lässt sich per MicroSD um bis zu 32 GB erweitern. Im Auslieferungzustand stehen dem Nutzer etwa 14 GB zur Verfügung, da das Betriebssystem auch einiges an Platz beansprucht. Das Unternehmen preist die kompakte Android-Box als einen 4K-Player, der eine Vielzahl an Video- und Sound-Formaten unterstützt. 4K-Material lässt sich sowohl von Festplatte als auch von einer Speicherkarte abspielen. Auf dem Player läuft ein für Fernsehgeräte angepasstes Android-Betriebssystem – der Nutzer kann somit auf mehr als 700.000 Apps zugreifen. Der MINIX Neo X8-H hat folgende Anschlüsse an Bord: 2 USB, 1 HDMI 1.4, 1 LAN, 1 AV-Out und 1 Micro USB. Der MINIX Neo X8-H kostet derzeit etwa 149 Euro, ist aber noch nicht lieferbar. Eine Variante mit 8 statt 16 GB Speicher wird für etwa 129 Euro angeboten. Mis Saludos este Producto Minix Neo X8-H / X8 Android en sus dos Modelos , ya se anunciaba su salida al Mercado en Mayo 2014, ya esta siendo distribuido para su Venta en EBay por U.K, Alemania y China con muy poca diferencias de Precios, solo que para empezar aún no hay una Oferta abundante por su Primicia al Mercado y su Inicio de Comercialización para la gran Oferta / Demanda que ya previenen sus Distribuidores desde Fábrica. Solo queremos que se establezca ese buen comienzo y tengamos los Éxitos esperados para este Verano 2014, pero si podemos afirmar que es el mejor Producto de su clase para tener un la conversión del TV Smart al mejor precio/calidad, de esta forma los Televisores TV Smart que llegan al desorbitante Precio de mas de 1000 Euros/dólares con solo 140 a 160 Euros tendremos las mejores prestaciones de Multimedia, Canales , Juegos y toda la Red Internet a nuestro servicio , esto si es la verdad de una Competencia para el Cliente/usuario de su propia Libertad y su Comunicación de forma sencilla, ágil y asequible para todos; es una realidad que nos da otra OPORTUNIDAD de llegar muchos mas a tener estos servicios de forma Económica y con la máxima calidad , Gracias a ellos a MINIX un Fabricante Excepcional para este Mundo Globalizado. Deseamos sus éxitos y con su gran distribución y su Uso , pues jamás se detienen. Gracias MINIX Android. con todo su capital Humano. My greetings this product Minix Neo X8- H / X8 Android on both models , and its release in May 2014, and is being distributed for sale on EBay for UK , Germany and China with little differences in advertised prices , only to begin with still no offer for its abundant Scoop Home Market and Marketing for the vast supply / demand already prevent its distributors from Factory . We just want that good start and it is established for the expected successes this summer 2014 , but we can say that is the best product in its class to have a conversion Smart TV best price / quality , thus the TV TVs Smart arriving at the exorbitant price from 1000 Euros / dollars with only 140 to 160 Euros will have the best performance of Multimedia, Networks , Internet Games and the whole network to our service, if this is the truth of a competition for the Client / Users of their own freedom and their communication simple , fast and affordable way for everyone ; It is a reality that gives us another opportunity to reach many more to have these services Economic and with the highest quality , thanks to them MINIX Manufacturer of outstanding for this Globalized World . We wish her ​​success and his great distribution and use , then never stop. Thanks MINIX Android. with all its human capital. Users / Customers of MINIX .